Posted in Iron Fist Brewing, Stone Brewing Co. There is no doubt that home brewer Ken Schmidt is a champ. Why? This is his second collaboration with Stone Brewing Co., after winning the the American Homebrewers Rally in San Diego, CA. 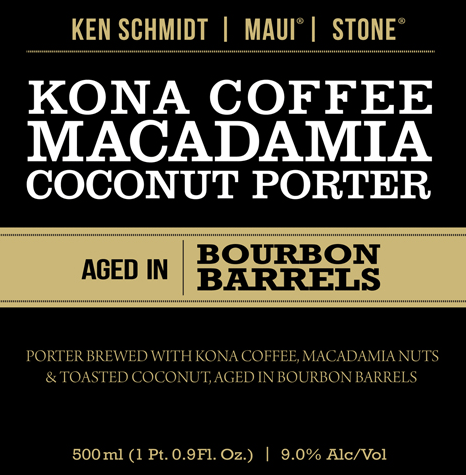 His first collaboration (Kona Coffee Macadamia Nut Coconut Porter) was brewed with Stone, Maui, and himself. This above Mint Chocolate Imperial Stout swaps Maui for Iron Fist Brewing. This is the 15th edition in Stone’s collaboration series. Availability: 12 oz bottles, limited Draft. Posted in Coming Soon, Maui Brewing Company, Stone Brewing Co.
What a great beer for our very first release of our new 500ml bottle size! We’re reserving this bottle for occasional limited releases of very special beers, and there’s no question that the Ken Schmidt/Maui/Stone Bourbon Barrel Aged Kona Coffee, Macadamia, Coconut Porter qualifies as just such. A while ago, we secretly squirreled away two oak barrels of this beer for a year+ nap and some resulting bourbonification. It’s cool to reflect on the fact that our now-yearly collaborations with local homebrewers are not just an acknowledgement of the amazing homebrew scene here in SoCal, but of our own homebrewing roots. Steve was quite an accomplished homebrewer when I met him in the early 90’s, and I think together we’ve accomplished quite a lot between then and today! As our head brewer, Mitch, can attest, this beer was not easy to make (the sheer volume of the fancy ingredients alone was a bear), and the wait has been long for the barrel-aged version, but worth it. I look forward to relaxing at home with it — maybe on now, and one in a few more years! Cheers from me, Steve, Mitch, Ken, Garret and the entire Stone Team!